Figure 1. Tall Foxtail (Setaria faberii) with its drooping brown spikes; and, Common Ragweed (Ambrosia artimisiifolia) with its slender, erect, green flower spikes in response to disturbance in 2005. Figure 2. Two views of a disturbed plot, Plot #7 in 2005 (left) and again in 2007 (right). This visual comparison is expressed quantitatively in Figure 3 (below) based on quadrat sampling data to make the two-year comparison. Did native plant species richness increase? 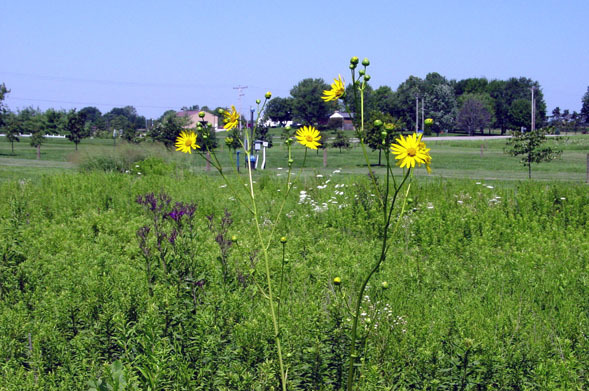 Recall that our objective was to decrease the relative cover of the dominant species, particularly Indian Grass and Tall Goldenrod in order to increase both space and resources so that native prairie species would be able to become established. 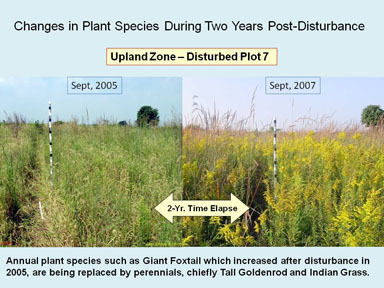 After the first growing season following the soil disturbance and reseeding in summer, 2005, we did observe that disturbance decreased the dominant species, particularly Indian Grass and Tall Goldenrod. However, we also found that the most obvious response to increased soil space and resources was on the part of the annual weed species (Figure 1). Of immediate concern is whether our treatment in 2005 would simply result in a "field of weedy annuals" or would the "window of opportunity" afforded by the disturbance favor establishment of native prairie species. The slight increase in per sample native plant species richness observed in 2005 gave us hope that a favorable trend was possible. 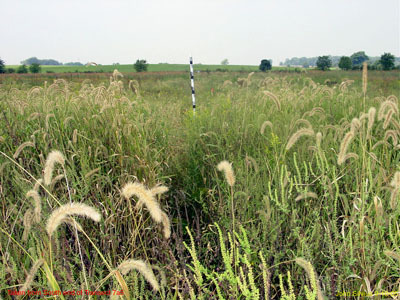 Hence, our plan was to re-sample the praire restoration community in 2007 to measure trends in native prairie species rechness. By 2007, the dominant perennial species had regained cover comparable to “control” levels while the two annual species had diminished by 44%. 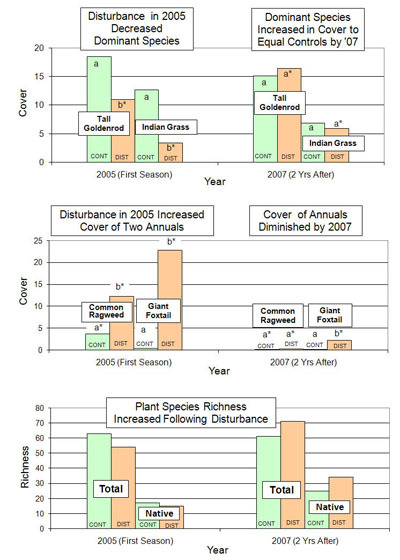 Meanwhile, percent cover of prairie forbs had increased in “disturbed” plots from 3.5% to 11.5% with little increase in “controls.” Native species richness increased in “controls” (17 to 25) and more than doubled in “disturbed” plots (15 to 34) suggesting that our disturbance/re-seeding treatment had acted over and above the effects of elapsed time at this early phase of restoration. Figure 4. Prairie dock, Silphium terebinthinaceum, a native prairie species, growing here in the Cedarville University Prairie Restoration, and also in prairie remnants in nearby Madison county from which the seeds for this plant were obtained. Prairie Dock is a rated as a very conservative species* in Ohio. Figure 5. 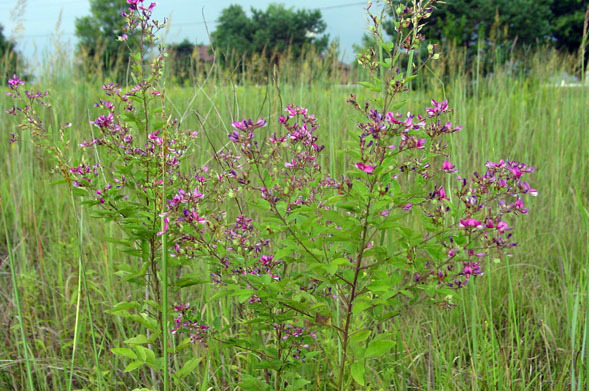 Canada Tick Trefoil, Desmodium canadense, a native prairie legume species which has increased in population in response to the disburbance treatment. Figure 6. 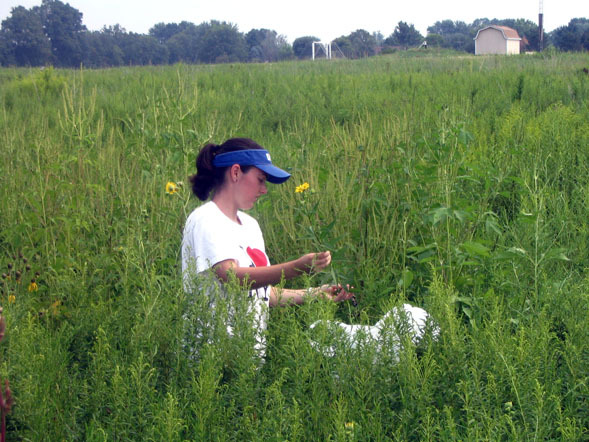 Tara Lawlor, Cedarville University research student examines a Sawtooth Sunflower, Helianthus grosseserratus, a native prairie composite which has increased in population in response to the disburbance treatment.